Following an open letter by Dr Vallabh Kathiria, former Union minister under AB Vajpayee and BJP leader from Rajkot, asking Prime Minister Narendra Modi not to allow environmental clearance to genetically modified (GM) mustard seed, several top economists have asked Modi to stop its commercial cultivation. Led by Prof Sudarshan Iyengar, former vice chancellor, Gujarat Vidyapith, ex-president, Indian Society for Ecological Economics (INSEE), and Gandhian, the letter has been endorsed by tens of economists, who claim to have been engaged in "issues of farm livelihoods, food security and related matters." "We are writing with concern about the recommended 'environmental release' of GM mustard by regulators in Genetic Engineering Appraisal Committee (GEAC) in the Ministry of Environment, Forests and Climate Change, Government of India", the letter says, adding, Supreme Court hearing on the issue makes it clear that "the Centre is keen on authorising this “environmental release”/commercial cultivation of GM mustard". "The regulators and promoters are stating that GM mustard has been successfully evaluated for food and environmental safety as well as for agronomic superiority", the letter says, adding, "However, there have also been many counter-arguments questioning the testing and appraisal procedures." Wondering how could the crop developers "themselves evolve test protocols and conduct tests themselves", with "no long term testing" having taken place "on health or environmental front", the letter claims, "GM mustard has not been proven to be a superior hybridisation or pollination control technology as compared to a non-transgenic hybridisation/pollination control technology called CMS (cytoplasmic male sterility) technology." Pointing out that "no such testing has been done that compared GM mustard against non-transgenic technologies of pollination control", the letter says, "In majority of countries around the world which grow rapeseed/mustard, seeds used are non-transgenic hybrids." 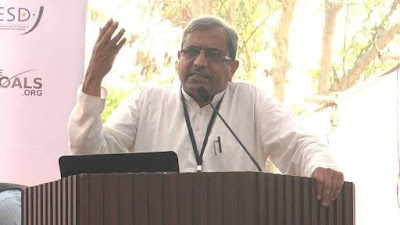 As regards the argument of agronomic superiority, about which Delhi University’s Centre for Genetic Manipulation of Crop Plants (CGMCP) has made "claims", and about which Kathiria has especially stressed, the letter does not agree with the view that that GM mustard's higher yields would "bring down India’s edible oil imports." Pointing towards "counter evidence" on "unacceptable and unreliable testing of GM mustard by using protocols that were evolved by the crop developers not adhering to the norms followed by all other public sector scientists of the country", the letter underlines, "Government of India has admitted in the Supreme Court in an affidavit in October 2016, that GM mustard has not been claimed to out-yield non-GMO hybrids". The letter quotes a sub-committee ofGenetic Engineering Appraisal Committee (GEAC), responsible for safety appraisal of GM mustard, as saying, “The yield comparison with national and local checks which has commercial use applications is beyond the mandate of the assessment” (Para 5.2 of final report of Sub-Committee of the GEAC dated 1-11-2016)." The letter fears, there is "likelihood of displacement of rural workers from manual de-weeding for daily or piece rate wages, because with an herbicide tolerant crop, farmers will spray weedicides on the crop rather than employ labourers for manual de-weeding." De-weeding is an important source of employment for poor rural women mostly. Such “weeds” are also sources of fodder for livestock. It further says, "Organic farming will be jeopardised with the commercialisation of GM mustard. This is a sunrise sector, on which the government is also investing through large flagship schemes, and a niche area in which India has the potential to be the world leader". The letter has been endorsed, among others, by Dr C Rammanohar Reddy, former editor of Economic & Political Weekly; Dr Indira Devi, Director, Centre for Excellence in Environmental Economics, Kerala Agriculture University, Thrissur; Dr Ranjit Singh Ghuman, Nehru SAIL Chair Professor, Centre for Research in Rural & Industrial Development (CRRID), Chandigarh; Prof Atul Sood, Professor, Centre for the Study of Regional Development, Jawaharlal Nehru University; Kamal Nayan Kabra, Former Professor, Indian Institute of Public Administration, New Delhi; among others.